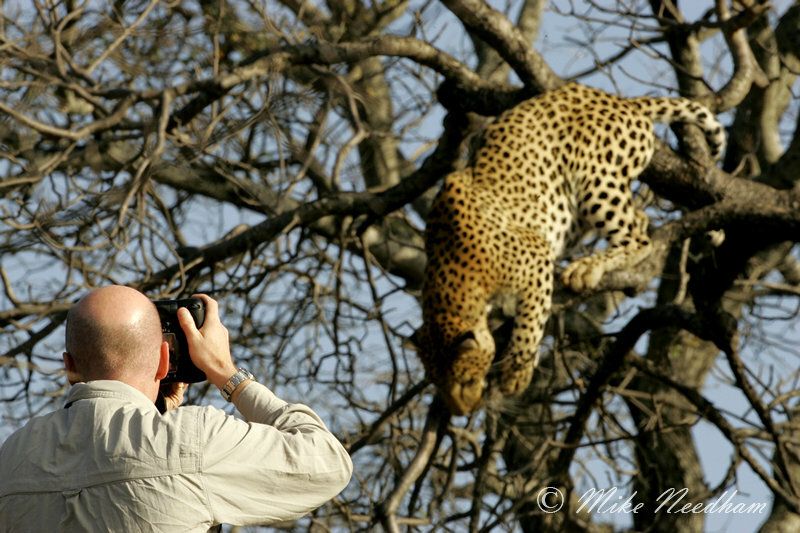 Trip Type: Specialist photography group safari booked direct with Wild4Africa based in South Africa. Accommodation was mainly bungalow / chalet type lodgings, all very comfortable, and travel between venues was by road (but return to Johannesburg was by air). 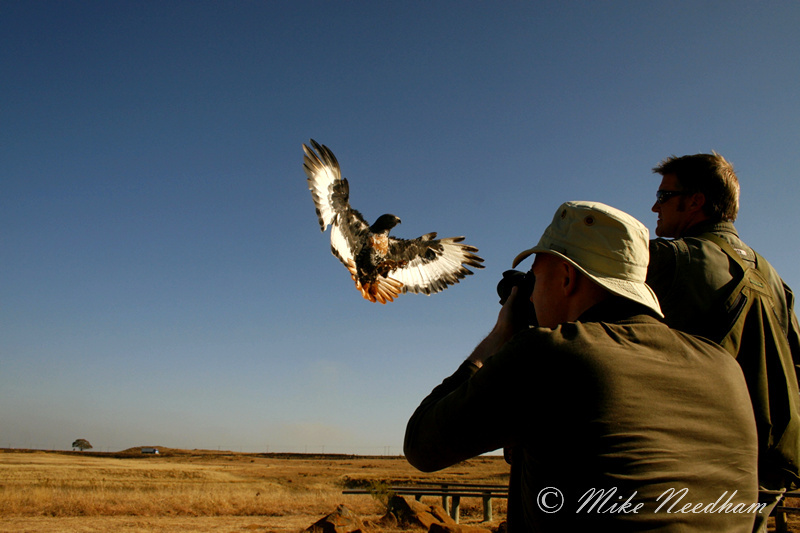 Outline Itinerary: Pick up at Johannesburg Airport, afternoon at a falconry centre with a dedicated handler, Kruger NP (3 camps, 1 week), private game ranch (Tshukudu, 3 nights), forest lodge (Moholoholo) at the foot of the Drakensberg Mountains (2 nights, with privileged access a wild vulture feed at a nearby research station and a full day at the local Khamai Reptile Park (small zoo) with a dedicated handler), flight back to Johannesburg. Equipment: Nikon D200/MD-200, D300/MD-10, Nikkors 200-400/4, 70-200/2.8, 70-180 micro, 50/1,8 AFD, 18-70/3.5-45, TC-14E, Wimberley WH-200, Gitzo GT3540XLS, radio remote, SB-800 + laptop, readers, duplicate ext. hard drives, etc. 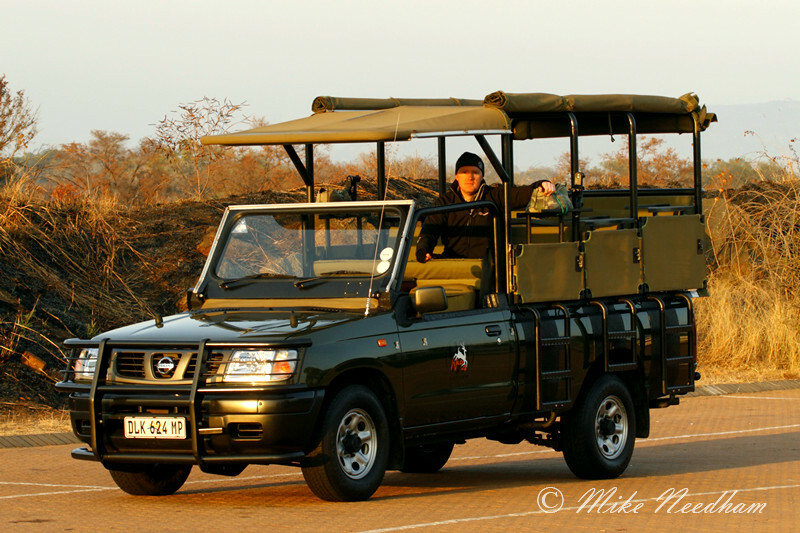 Modified, very photographer friendly, Wild4 safari vehicle. First let’s deal with the photography low points. I would have liked more time everywhere! Each and every destination was so good and so productive that I never wanted to leave and move to the next place, even though I knew that was likely to be just as good as, or even better than, the last. This was hard to bare! Even the lodge at the end of the trip had a sunken hide so that you were shooting at ground level whilst standing. This overlooked a small water hole 5-10m away in the forest which was visited by significant numbers birds and animals. I could have easily spent a week just there! Stu (“Mr. Wild4”) had clearly put a lot of research and personal experience into planning these trips and it really did pay off big time! Seriously, I am particular about my trips but there was nothing on this trip, other than staying for longer, I would have had organized differently. It was that good. I could easily write reams about the various positive aspects of this trip so I will try to resist and hopefully keep things concise. Next stop was Kruger NP. I will never forget getting to the entrance on the first morning before the park opened (we then remained in the park all week) and waiting as other safari vehicles started to arrive, often with 8, 10, sometimes more people per vehicle. There I was with a whole vehicle to myself, I felt very fortunate and perhaps just a little embarrassed. The park was excellent and over the week very productive, certainly very different to when I had last visited. The park can be quite busy at times but is big enough for you to find little quieter and secluded areas if you look for them and have some local knowledge. Stu knows the place like the back of his hand and that certainly helped. We saw, and photographed, just about everything that you would expect during the week. 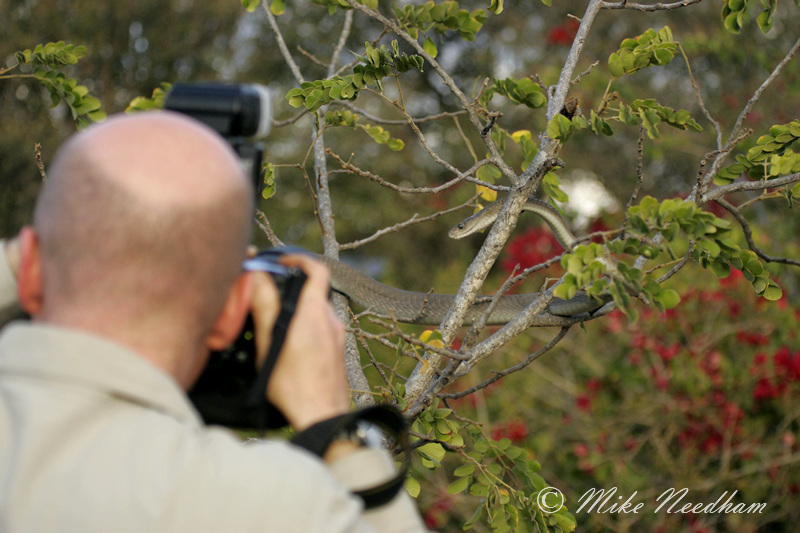 Only leopard really eluded us which caused Stu some clear frustration, but I explained that I was not looking to tick off a list (I had seen wild leopards previously in Kenya and Tanzania), and if we did not see leopard then that was of little concern to me. However, true to form on our drive out of the park on the final morning something darted across the road about 50-100M in front of us. 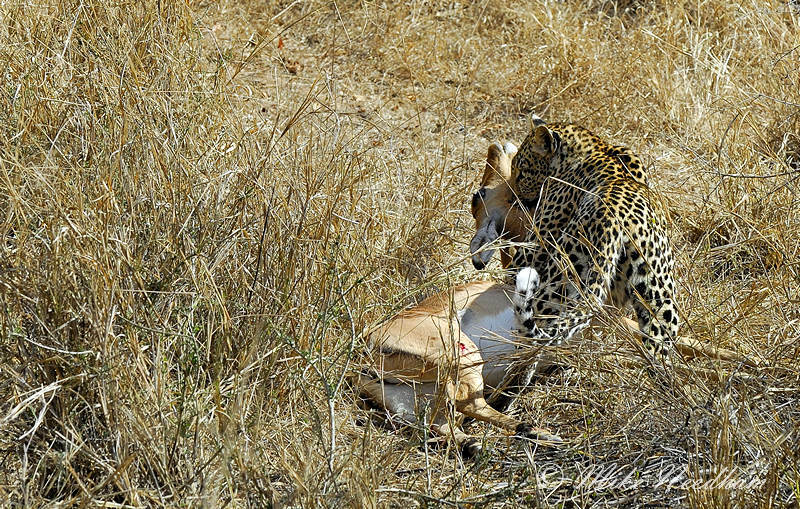 When we arrived at the spot we saw that it was a leopard, its mouth around the throat of an impala which it had just dragged across the road. Quite how the leopard could move so quickly dragging something approximately its own size and weight (and no doubt trying to struggle), if not more, I still find amazing. I grabbed 3 frames before it disappeared, with its victim, into the bush. Ten minutes later we were out of the park. From Kruger we drove the short distance to Tshukudu, a privately owned and run game lodge on a private wildlife reserve covering approx. 5000 ha of bushveld close to Hoedspruit in the Limpopo Province. Before the trip I had mixed feelings about this part of the itinerary as it sounded a little too much like a zoo (I have no problem per se with zoos but S Africa is a long and expensive way to go to visit one and it seemed a shame when I could be in a National Park). However, there was the promise of a pack of wild dogs in a very large and natural enclosure and this tempered any doubts I had. However, a few weeks before the trip, and knowing my specific interest in the dogs, I got a note from Stu stating that he had just heard that the dog pack had been moved to another reserve and he would return my monies should I wish to cancel. 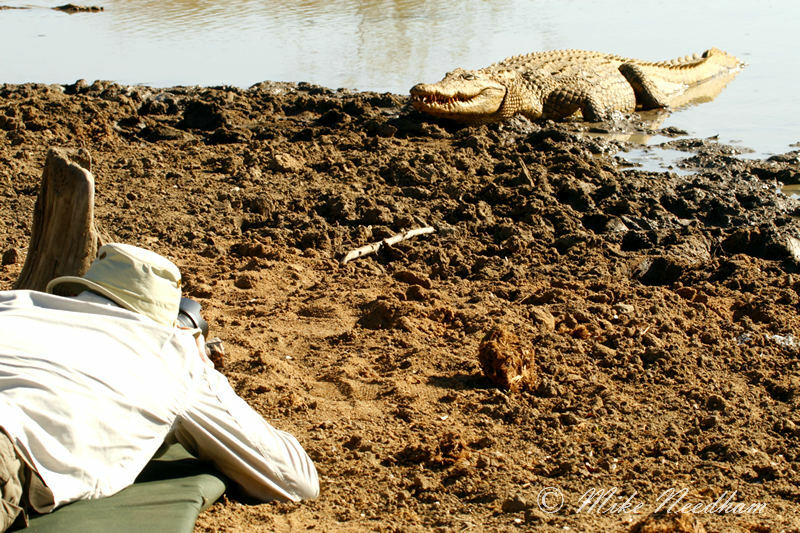 There was no chance of me voluntarily doing that, dogs or no dogs, so I left for South Africa a few weeks later half expecting this part of the trip to be something of a poor relation to Kruger. We arrived at Tshukudu just in time for lunch and literally within 15mins I was very glad it was a part of the trip. Over a glass of cold fresh orange juice I was introduced to Wayne who was to be the local guide accompanying Stu and I during our stay. 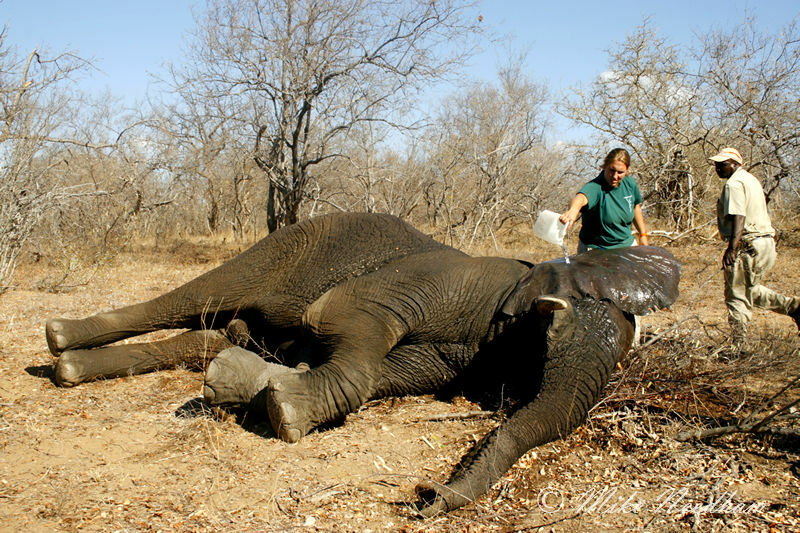 As we exchanged the usual pleasantries he calmly dropped into the conversation as though an every day occurrence that the local vet had just arrived and was planning to tranquilise one of the elephants to inspect an infected foot. “Would you like to tag along and watch, but it would mean rushing lunch?” he asked almost apologetically. Needless to say lunch was quickly dispatched. What an experience and what a start. 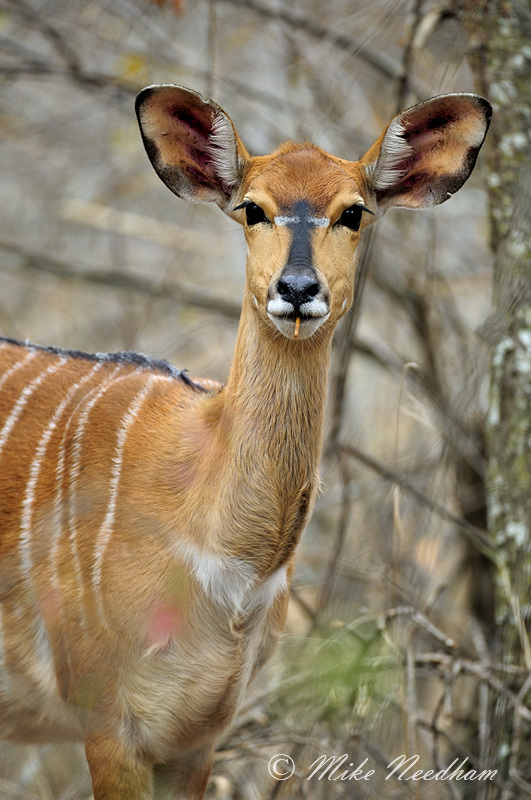 Arguably all of the animals at Tshukudu are captive; the herbivores freely roam the reserve whilst for the most part the predators are kept within large fenced enclosures. These enclosures are simply regions of bush encircled by a large fence within which the predators are kept and fed. These enclosures varied in size from a few hundred m2to that containing the lions which was so big I did not get a feel for its true size despite driving through it. Needless to say backgrounds were very natural looking (because they were natural!) and rarely did a fence intrude. Chatting with Wayne and Stu after the elephant outing (which also yielded some wide-angle shots of other herd members from on foot as they inquisitively came over to see how their companion was doing) it quickly became apparent that Tshukudu was going to be a very special few days. Apparently there was a ‘tame’ hand reared cheetah living free on the ranch and surrounding land who would turn up from time to time (and who did indeed turn up at the end of my stay but I chose not to photograph her as the other cheetahs had been so productive and there was so much else to do), there were two wild male cheetahs who were about to be re-released who I got to go in with on foot, some magnificent leopards, a lion pride who I spent little time with due to everything else going on, a lion cub we would take for a walk and photograph as we went. But the real star for me, a newly arrived wild dog who had been too badly hurt when he ran into a fence to be returned to the wild. Again, I got to go in on foot with this guy who proved to be a skittish but curious subject. I could simply say what I wanted to do and when, so the predator photography tended to be concentrated in the golden hours of the best light. 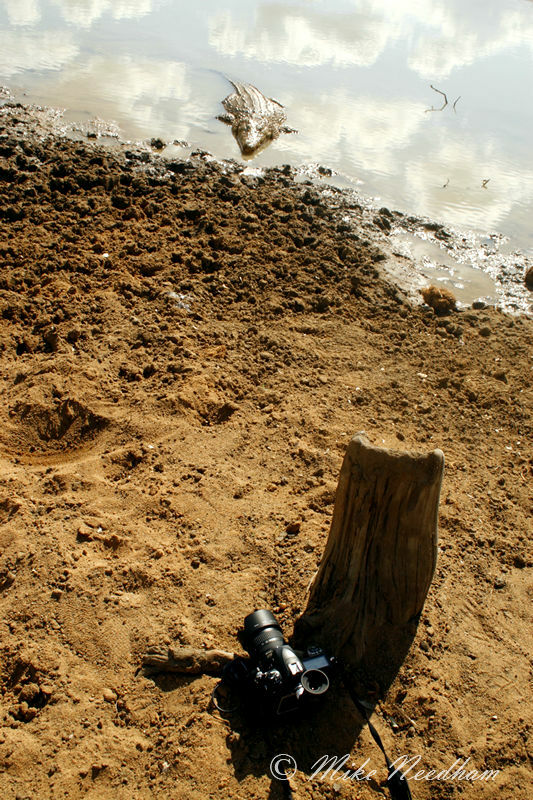 As if this was not enough I also photographed hundreds of vultures coming in to an elephant carcass (not the one tranquilised, that was fine), white rhino with a wide angle lens leaning over the back of the Landcruiser, a croc in the local water hole (initially laid on the ground with a telephoto lens and then with a wide angle, remote control and a little bait), a herd of buffalo drinking shot from ground level (within easy leaping distance back to the Landcruiser) and a captive caracal owed by one of the staff and not usually accessible to visitors. There were other things too but, to be honest, any one of the above opportunities would have been a trip highlight on any other occasion and would merit more dedicated description, to do them all in just a few short days was both exhilarating and exhausting. 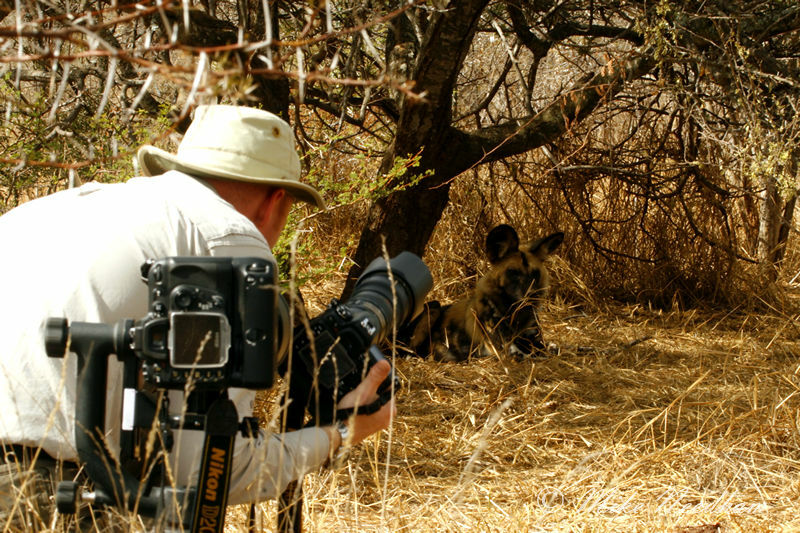 With places such as Tshukudu it is easy to see how many ‘wildlife’ pros are able to reliably turn out such incredible images, and indeed many (including David Attenborough with the BBC NHU) do go there and similar establishments. I was sad to leave Tshukudu, I’d had an amazing time there and the trip was coming to an end. However, the final destination would live up to the offerings of the rest of the trip and would not let the photographic frenzy subside. Stu and I left Tshukudu and headed for Moholoholo Forest Lodge at the foot of the Drakensberg Mountains, again a fairly short drive and arriving in good time for lunch. This big male leopard was a real star (thankfully there was a large fence between us! That afternoon we visited a nearby vulture research station to photograph the birds coming in to feed followed by a short game drive in the area around the lodge (the previous day we had seen hundreds, if not thousands, of vultures come in to the elephant carcass at Tshukudu so most of my vulture shots were taken then but this was a fabulous and scheduled opportunity under any other circumstances). The next day we had a full day at Khamai Reptile Park, again just a short drive from the lodge, indeed we returned to the lodge for lunch it was so close. I have to confess to having a very strong interest in photographing reptiles, amphibians, insects and arachnids etc. and this day was again one of the highlights of the itinerary when I had booked the trip. The day was a fabulous experience, starting with baboon spiders (including a particularly rare species endemic to the local area) and chameleons, and progressing through to various snakes including a vine snake, green mamba, snouted cobra, puff adder, a young boomslang and the infamous black mamba. 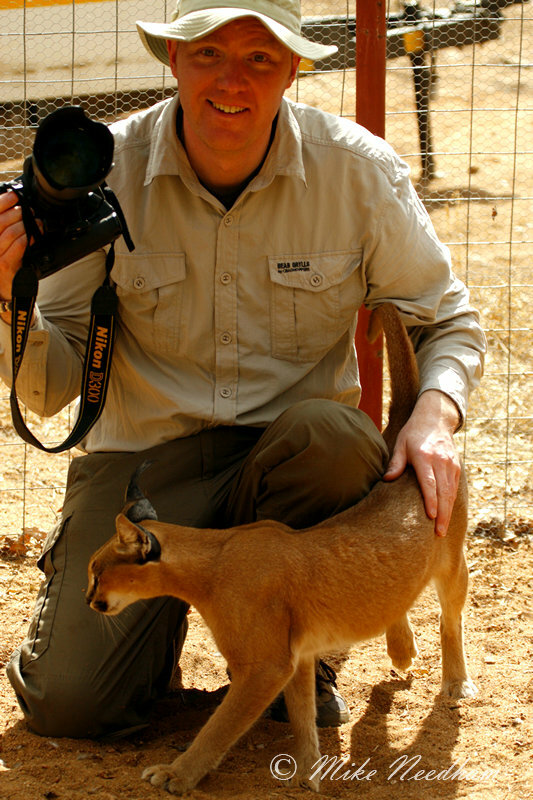 The animals were expertly and patiently handled by one of the keepers, this was done in a very safe and controlled manner for both the subjects and me. That said the safety precautions did not limit the photographic opportunities and at no time did I have to shoot from behind glass or similar barriers. The Health and Safety managers of similar European parks would surely not permit such activities in our overly sanitized and cosseted world. There was a ‘low point’ however, being persuaded to hold one of the (harmless) baboon spiders, not something that I would care to repeat. It felt remarkably light for its size but once it started to walk over my hand it was time for me to suggest that it was perhaps time to move on. I seem to remember Stu found it very amusing! 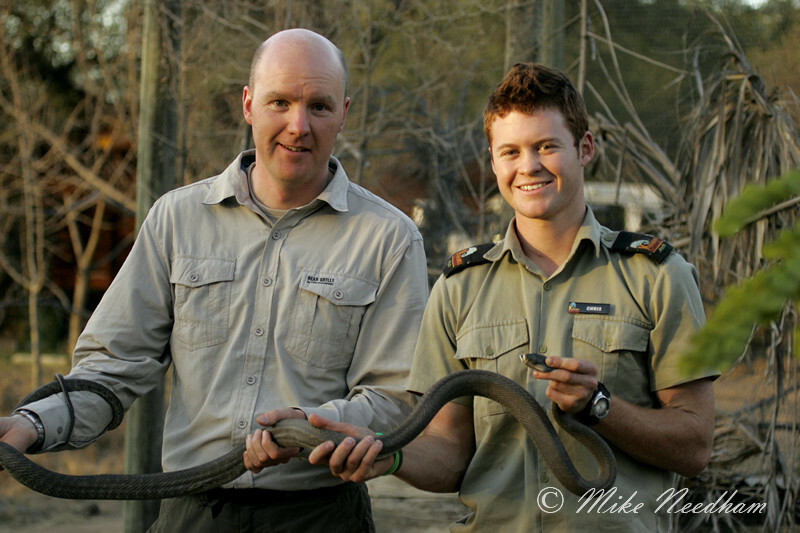 To counter this however was the high point of being able to hold a (deadly) black mamba. Amazing! You can feel the soft muscular power through the surprisingly soft, smooth skin. …….something makes me think that I perhaps did not get my reactions to these creatures the right way around? As if all of this was not enough Moholoholo Forest Lodge has its own bird hide underneath the main dining area for the few times when you may have an odd minute or two spare. 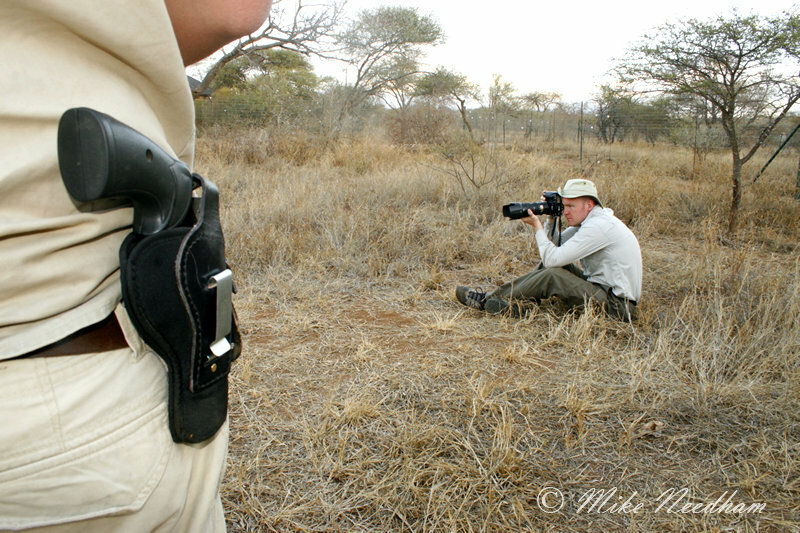 The hide overlooks a small waterhole and water drip with facility to secure a tripod head at the large openings. There is no problem here using a lens of any size (there is room for a Nikkor 2000mm mirror if you were so inclined!). 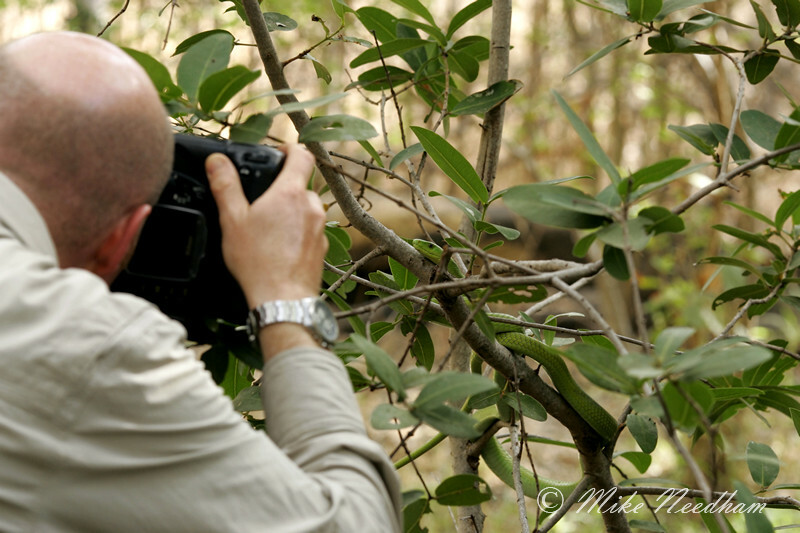 The lodge manager is apparently a keen wildlife photographer and his interest has manifested itself in a wonderful hide that is close enough to the subjects to obtain good images of even small forest birds. Other visitors included boar and antelope, including the beautiful and shy nyala, and one evening we even had an owl come down to drink. There were numerous bush babies to be heard in the forest at night but sadly I never saw one of them. Photographically this has to have been the best trip that I have done (so far), and I think it is unlikely anything else will ever surpass it unless I win the lottery (which I don’t do), even then it would be a tough task. But it is nice to keep on trying……. Firstly, I must on this occasion clarify “group safari”. The trip was limited to only 3 photographers in one vehicle (a large customised Landcruiser) so that everyone has the use of a full bench seat and therefore access to both sides of the vehicle. Non-photographing partners could also go, at a slightly reduced rate, but had to share the bench of their photographer partner. No real hardship as the seats went the full width of the vehicle and even 2 per bench would be considered normal on a good photographic trip. It would be a real luxury on a ‘tourist’ safari and only happen with good fortune or exclusive booking of a vehicle for a small party. This at least is what I signed up to, however about 2 months prior to departure (very close in my eyes, I had booked well over 12 months in advance) the website was still showing two photographer places available, which as my wife was not going, meant I was the only person booked on to go. Concerned that my trip would be cancelled at the eleventh hour I emailed Wild4 and asked that they let me know when someone else booked so that I would know that the trip was definitely on. I got a prompt reply saying, in effect, “don’t worry, we will go regardless and we will have a great time”. No one else did book, so true to their word I was the only guest on the trip, just me, Stu (‘Mr. Wild4Africa’), Justina (Stu’s wife and wonderful safari cook) and Stu’s mother who would drive the spotter vehicle so that we could cover a greater search area in Kruger. During the day in Kruger and the whole of the trip outside of Kruger there was just Stu and I. What extravagance, what a trip! Everything was so professionally put together, and at the same time personal and friendly, it was like going on safari with friends who had already organized every detail. I think it is important to point out something else here, this was in the early days of Wild4 and word has spread such that the trips (often now with 2 vehicles of 3 photographers each) fill up quickly, and for good reason. So book early, you will not be disappointed. It is worth while giving a quick mention about Stu’s safari vehicle too. It was a Landcruiser which, superficially, was typical of those used in the region for safaris. However, Stu had gone to considerable effort and expense to customize it for photography. In the centre of each bench area was a foam lined wooden box designed to store and protect your cameras and lenses when not in use. There was even a compartment sized to accept a 600mm f/4 with a pro body attached. Having the whole vehicle to myself I never had need of it but if the vehicle had been more populated I can imagine that it that it would have been very useful. At both ends of each seat was a reversible metal shelf or platform attached to an upright welded to the vehicle, fundamentally similar to those used on the Kicheche vehicles in the Masai Mara (see here) but much better implemented. The shelf could be fixed either to face into or out of the vehicle and was adjustable for height, creating the perfect platform for a bean bag or tripod head. Each photographer had two of these, one at either side of the vehicle and, if you prefer not to use a bean bag, each shelf had slots machined into it to permit a tripod head to be fitted (Stu even provided to screw fittings). My Wimberley worked a treat although I used large heavy bean bags (again supplied by Stu) for most of the time in Kruger as this is what I am more familiar with on safari. Bean bags can however somewhat restrict manual focusing and zooming so I would switch routinely from one to another to suit what I was doing. If you are thinking about doing a trip with Wild4 and have some specific questions then please feel free to contact me, however my ultimate advice will be “go for it”. 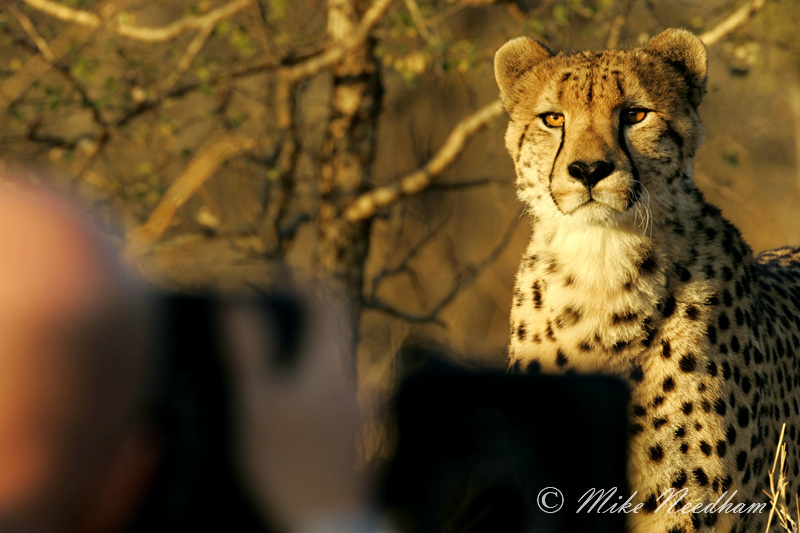 I think that you are unlikely to get a better photographic safari in South Africa. Yes there are budget alternatives, and more expensive options with fancy table cloths, silver cutlery and waiter service, but if you want an unforgettable photography based trip with a good level of comfort this is for you. 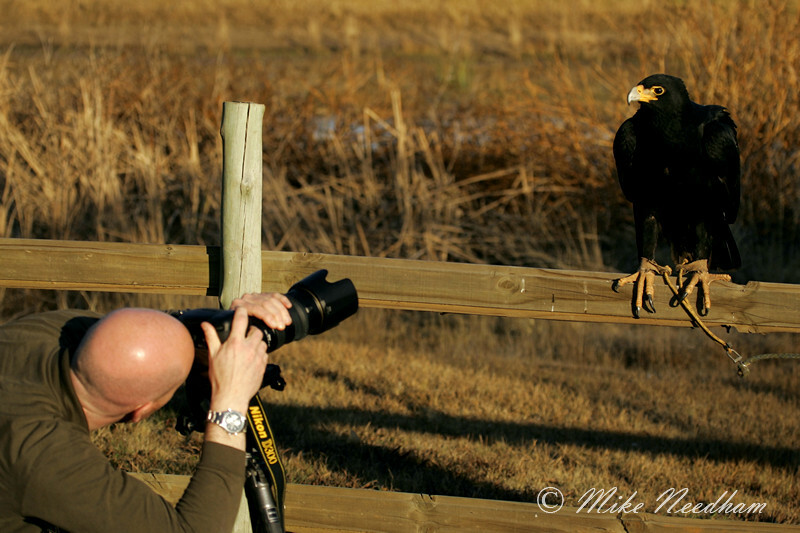 Stu is himself a very capable photographer too, and will happily help with tips and advice should need (or want) it. 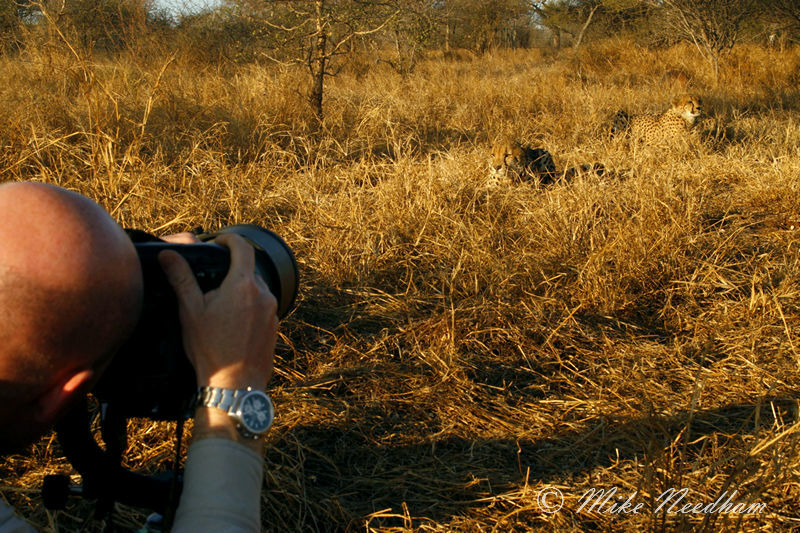 Non-photographing partners or friends will also get the benefit of a superbly organized and run safari. 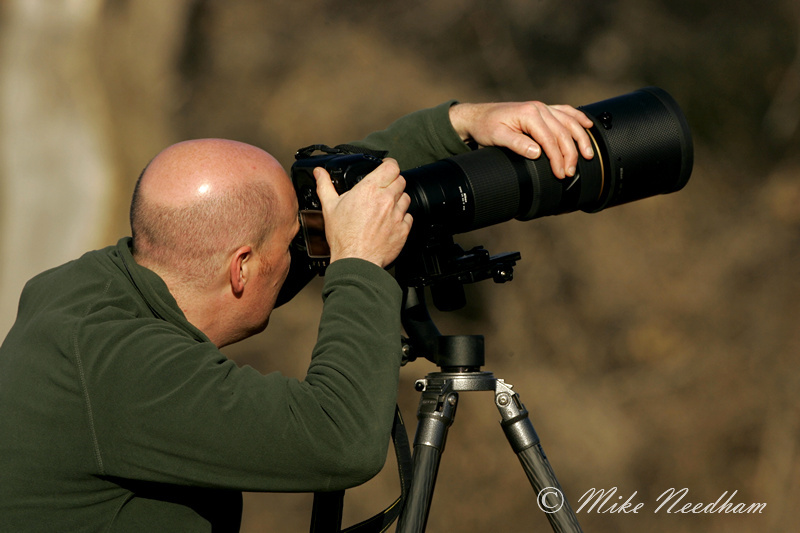 The shots of me ‘in action’ were taken and supplied by Stu during the trip – Thanks Stu!